Contribute to kazurayam/KatalonDiscussion7609 development by creating an account on GitHub. I think By.xpath() call with expression containing matches() function would NEVER work. The matches() function was defined in XPath 2.0. As the following post tells, the Selenium WebDriver’s By.xpath implements XPath1.0, but lacks XPath2.0 support including matches() function. Is string matches() supported in Selenium Webdriver 2? How are XPath1.0 and XPath2.0 different? — see jaxen - FAQ / Which version of XPath does jaxen support? Does jaxen support XPath 2? section. 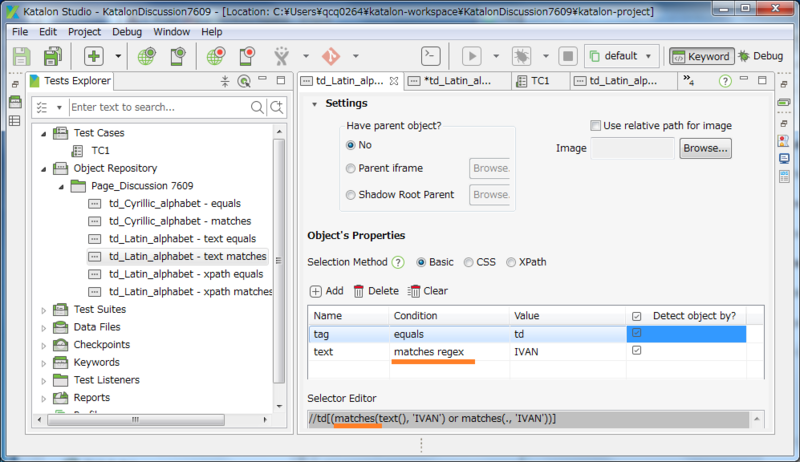 I suppose all of Test Objects in Katalon Studio with Condition “matches regex” will not work properly. Katalon team should consider removing the Condition “matches regex” completely. If Katalon Team can tell me how to make “matches regex” work properly, I would like to see it as I could not find any documentation about “matches regex”. **matches regex **doesn’t work either. It seems also that the condition “ends with” doens’t work either, so Katalon team should consider removing the Condition “ends with” completely also. Ah, yes, “ends with” was added in XPath 2.0 as well. Updates? Do you expect matches() to work in future? Do don’t think it will happen. Don’t know why this bug is not fixed. But anyway, matches() seems like a very common use case. OK, let’s wait for @Katalon team to respond to us. Any update on this @Katalon_Studio ? This is indeed a very common use case, especially when I have to test 3rd-party integrations, and have no control over the code. Regex is a needed fallback. 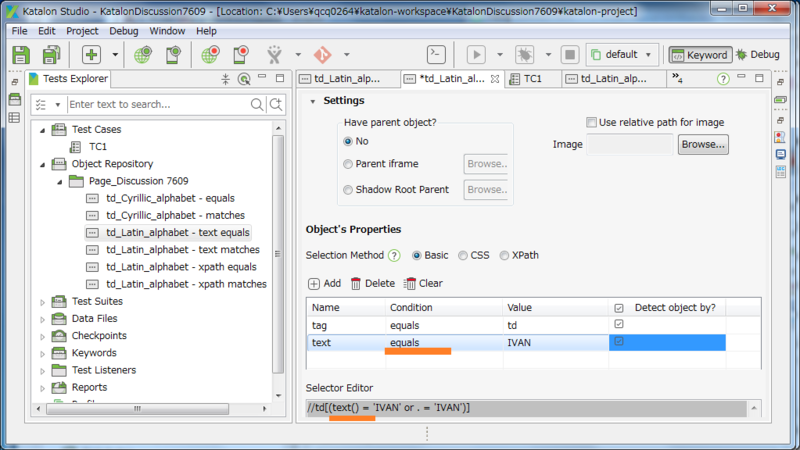 I think Katalon Studio would never be able to support XPath matches() function. I explained the reason above. I understand your point on removing options in Katalon… But I am a bit disapointed as Xpath is a powerful way to handle HTML documents and, to speed-up test creation and execution. Hence, I would rather pledge for an update to Xpath2.0 and a little clean up of the attributes detection interface. There is really interesting functions in the v.2.0. When I run the test case, Katalon Studio calls org.openqa.selenium.WebDriver.findElement(By.ByXpath). The string //td(matches(text(),''IVAN)) is transferred from Katalon Studio to browser (for example, Chrome). Chrome browser interprets the string //td(matches(text(),''IVAN)) as XPath, and evaluate it against the DOM of a Web page. The thing is, it is browsers (Chrome, Firefox, etc) who evaluates the string as XPath. Katalon Studio is not concerned about if the string is an expression conformant to XPath1.0 or XPath2.0. All Katalon Studio does is saving the string and transferring it to browsers. It depends on Browser’s capability if it supports XPath 2.0 or not. According to https://stackoverflow.com/questions/25455351/does-chrome-use-xpath-2-0 , Chrome uses libxml which supports XPath 1.0 but not XPath 2.0. If you want to use XPath 2.0 expression in Katalon Studio, then you need to convince the Browser vendors (Google and Mozzila) to hear your wishes. I believe that Katalon Team has very little they can do for changing Chrome and Firefox. And I guess, Browser vendors will not be interested in XPath2.0 support; they are serious about CSS and JavaScrit, but not about XPath features any longer.